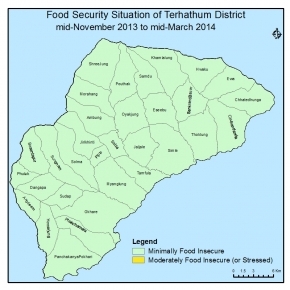 The overall food security situation of the district was Minimal food insecured during this period for both the clusters. HHs had sufficient food stock on average for 3 months due to recent harvest of paddy, millet and previous stock of maize as production of paddy improved by 9.5% on irrigated land compared to last year. Market stock was found to be sufficient as regular supply, however market price of food commodities increased by 5-10% for cluster A and 10-15% for cluster B. In this period, high level of income through sale of cash crop (cardamom, ginger, vegetables ) and NTFP (chiraito, medicinal herbs). It has been revealed that cardamom alone transacted 26950 million through export to India. Likewise, income through livestock meat production was estimated to be Nrs. 235 million as production and consumed in the district itself. Wage empoyment was found to be sufficient in the VDCs and at the headquarter in agriculture sector for cardamom , ginger harvesting and in private construction works. Remittance was the second major source of income that contributes to an average of Nrs. 150-160 million to support for food security as 7 people out of 10HHs being out-migrant for working purpose in abroad countries. On the part of utilisation, water supply system being well facilitated however lack of proper management, sanitation had been a problem. Above all, coping was found to be traditional and optimium calorie intake as of festival season. In this period, no any case of epidemics and severe diseases observed though climatic hazard. fire caused 34 HHs completely destroyed in headquarter and Sabla, Dangapa,Solma,Basantpur VDC. With all the condition remaining normal, no out-migration was observed and bandha , blockades though seen for 10-15 days before constitution election causing very less effect on the normal life of the people.nd act as major key for income to improve the food security situation. The food security situation for both the clusters is predicted to remain minimal food insecure condition with HHs food stock remaining on average for 3 months due to stock of paddy and purchase through sufficient market . Income continious through cash crop-cardamom, ginger and vegetable and NTFP . livestock products especially meat and milk prodction will decrease to some extent though consumption will be enhanced. Wage employment too will be sufficient in the VDCs . Remittance will continiously support and act as major key for income to improve the food security situation. Above all, coping strategy will be traditional Likewise, climatic hazard snowfall may cause to effect the normal life of people as well as livestock and wild animals. Similarly, seasonal diseases like jaundice, pneumonia may be observed in the district due to cold climate. Civil security situation will be improved as no bandha and blockades will be seen during this period.